FSM 2300 – Read it! The new Forest Service recreation Directive 2300, the Zero code was released late last year without much celebration. But it’s a very important document in that it provides the foundation direction for Recreation, Wilderness, Heritage, and trail management along with other program areas. You should read it, share it with others and discuss what it means to your program management with your recreation team. Our sustainable recreation symbol and the 4-“Ps” comes from this document though it does not jump out at you. That is our goals are to Provide and Protect, and our focus is to so with Partners and to Perform a high level, carrying our mission efficiently and effectively with a focus on results. There are some major changes from the past including the idea of sustainability. This is direction and it should be carried out day by day and incorporated in your planning. Hi, thought I’d share a few of the ways that myself & my fellow conservation minded equestrian help to be part of the solution! Top down, we engage with the land managers (mainly Nat Forest & Parks but also state Forests & Parks). 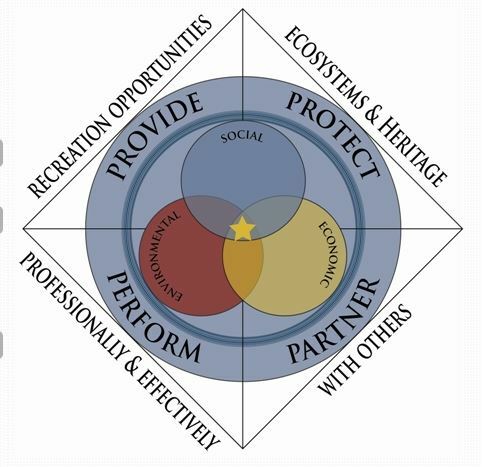 I am serving on the Nantahala Pisgah Forest Partners, which is a group of stakeholders collaborating to recommend ways to improve the new Forest Plan, N/P being an “early adapter” we’re under the 2012 mandate of citizen involvement, which has been very interesting. I’m co representative of the Recreation group with the IMBA & Amer Whitewater reps. We’ve also been taped to serve on the National Forest Foundation Forum that is working solely on the Plan revision. I feel that by acting in this arena, I can bring understanding of the equestrians to the other stake holders and help to interpret the management of the Forest back to my fellow horse folks. I’m an officer in the Back Country Horsemen of NC, a chapter of BCH of America. The resources & knowledge sharing from the National org are invaluable to members who are concerned about riding light on the land. We are aware of trail conditions, and when we will make a larger impact like during freeze/thaw conditions or after a rain, and minimize our trail access at those times. As an active Forest Volunteer, I am a certified “Leave no Trace” trainer for equestrian practices as well as a certified sustainable trail builder. This is helpful to keep working in the sustainable way when we make improvements to the trail, and also to help work alongside the Forest Service Rangers & other volunteers like hikers & bikers. We find that we can make less impact with a horse packing supplies & tools into work sites than mechanized vehicles. I have written grants to engineer & fund sustainable high lines, horse containment methods to give horse campers a much kinder gentler on the land way to overnight their horses. All rides that I participate in are mapped and I carry loppers & a hand saw. A person on a horse can clear the canopy much easier than on foot and get further out to recon damage to trails. Mapping helps us pinpoint troubled areas (larger downed trees, eroded trail, areas that are causing siltation etc) and help us discuss the best course of action with the land manager.